*Summer Holidays* Cheap non-stop flights to the Faroe Islands from €115 or £119! Roundtrip flights from Dublin to Montreal in Canada from €243! Vueling promotion code 2019: get €20 discount all flights! Spanish low-cost airline Vueling (HQ in Barcelona) has just released brand new voucher code for next travel period in 2019. Together with their currently running promotional deal offering 1 million discounted seats (check our this deal in our previous article here) you can now book some very low-priced flihgts when traveling across most of European countries with Vueling. Note that the discount is up to €20 off base fare depends on the tariff and route you choose. Simply enter this Vueling promotion code to the box and proceed. Your next flight will get automatical discount. If you want to book cheaper flights with this European low-cost airlines this is easy way to save..simply use currently valid Vueling promotion code and fly for less.. This Vueling discount code 2019 is valid for return flights booked directly through the website of this airline. There is different promotion code based on the country of your departure. Please refer to the details below if you want to take the advantage of this opportunity to further discount your flight including the already discounted deals. 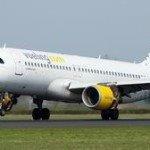 This promotional offer is valid only for return flights booked with Vueling. Vueling connects Spanish cities (Madrid, Barcelona etc.) with other main European markets. You can book discounted flights to the UK (London, Birmingham, Edinburgh). Also to Germany, Amsterdam, Brussels, Paris . Main airports in Italy as wel as Eastern Europe or Scandinavia..Moreover Vueling also offers its service to Africa. (Morocco, Senegal or Gambia). How to Apply Vueling promotion code 2019.: Simply reveal below voucher and choose your promo code based on country and once you choose your return flight you can apply this promo code from the country of your departure. You can find separate box “Do you have a discount code” right below your chosen flight still at the step one. This Vueling promotional code 2019 is valid for flights in travel period between 5th of May till 21st of December 2019. Blackout period during Easter and summer holidays. There are however limited seats and tickets (2000 for each country) so hurry up if you want easily save with working Vueling discount code. Also remember that you can apply this discount code for flights commencing 21 days the earliest. (from the date of your booking). This Vueling discount code 2019 is possible to apply to bookings with max 5 passangers.